The free game Pixelated, one of the ten most popular games in BlackBerry AppWorld, and currently the fourth ranking free application has been upgraded to version 2.0. This new version adds support for the BlackBerry Curve and Bold so that the application now supports almost all devices. The full list of supported devices now includes 8330, 8350i, 8520, 8530, 8900, 9000, 9500, 9520, 9530, 9550, 9630, 9650, 9700 (min OS 4.6). The new version of the application also adds a number of new features, including such as an Achievement system, and the ability to backup/synchronize game settings. All versions of the BlackBerry Curve and Bold are now supported, in addition to the devices that already were. This brings the full list of supported devices to the following: 8330, 8350i, 8520, 8530, 8900, 9000, 9500, 9520, 9530, 9550, 9630, and 9700. The game will also support the 9650 when it launches. In game achievements can be an easy way to track your progress through the game, and to show off your accomplishments to others. Pixelated Plus now offers backup/restore synchronization through BlackBerry Desktop Manager. This allows you to back up your settings and achievements to your computer and to allow them to be kept if your operating system needs to be reset or upgraded. Parts of the interface have been upgraded for a better and easier experience. Additionally theme support has been greatly expanded so that Pixelated now works with a greater number of custom themes. Pixelated Plus Version 2.0 is now available for download from BlackBerry AppWorld. This version comes with a number of improvements ranging from greater device support to achievements and synchronization, to the much requested move counter. A move counter has been by far one of the most requested enhancements to Pixelated. While it has no effect on the gameplay it can help you know how well the current game is going so you can better manage your moves. The move counter can be turned on from the options menu. Pixelated Plus now offers backup/restore synchronization through BlackBerry Desktop Manager. This allows you to back up your settings and statistics to your computer and to allow them to be kept if your operating system needs to be reset or upgraded. Today Research in Motion showed a preview of their upcoming Webkit based browser which at the end scores a 100/100 on the Acid3 test. Video demo below. BlackBerry has come along way in regards to the Acid3 test in a short amount of time. When I first looked at the BlackBerry’s performance on the Acid3 test 9 and a half months ago it only scored a 54/100. Then along with the release of OS 5.0 just 4 months ago BlackBerry improved to 91/100 on the Acid3 test. It has since improved so that it now scores a 93/100. A few models of the BlackBerry Curve 8330 are now being upgraded to operating system 5.0 which will make them compatible with the Hockey Scores and 10,000 Farkle applications. As this is older hardware, the applications may run a bit slower, but we are still happy to add compatibility for these very popular devices. Hockey Scores for Blackberry has been upgraded to version 1.6 for all supported devices, and is now available for free through BlackBerry AppWorld. Version 1.6 of Hockey Scores is supported on all BlackBerry Devices with OS 4.6 or newer. This makes the upgrade available to everyone who previously used version 1.3 or 1.5 of the application. The full list of supported devices at this point include the 8220, 8230, 8350i, 8520, 8530, 8900, 9000, 9500, 9520, 9530, 9550, 9630, and 9700. 10,000 Farkle is a dice game that requires both skill and luck. Points are awarded for various dice combinations, but if a roll fails to contain any combinations the turn ends with no points awarded. 10,000 Farkle is available for the BlackBerry Storm, Tour, Bold, and all versions of the Curve with at least OS 4.6. The full list of supported devices are the 8350i, 8520, 8530, 8900, 9000, 9500, 9520, 9530, 9550, 9630, and 9700. Now available for free in BlackBerry App World is the Hockey Scores app that is the quickest and most effective way to get NHL scores from across the league straight to your phone. This is done in a simple and efficient way so that the scores can be updated as quick as possible, and require no effort your part. Pixelated, a simplified but free version of Pixelated Plus has now been updated to version 1.2 in BlackBerry’s App World. This update expands the number of supported BlackBerries to include the 8900 Curve, the 9700 Bold, the 9630 Tour, and the 9500, 9520, 9530, and 9550 Storm. Pixelated is a game of colour in which the object of the game is to change the colour of the squares until the entire screen is a single solid colour. This is done by using the coloured buttons on the bottom of the screen to change the colour of the square in the upper left hand corner and those surrounding it. Changing this square to the colour of those around it, allows it to slowly grow until it fills the entire screen. The ultimate goal is to do so in as few moves as possible. While Pixelated lacks some of the advanced features found in Pixelated Plus, such as stat tracking and additional playing modes, Pixelated is still a fully functioning game with no limits on it’s game play. Pixelated Plus, one of the top rated puzzle games for the BlackBerry Storm and Tour, is now also available for the BlackBerry 8900 Curve and the upcoming Bold 9700. Pixelated Plus is a game of Colour and Strategy. The newly released version 1.2 adds support for the 9700 and 8900. This update now displays the instructions when it is run for the first time and also addresses some font issues. About Pixelated Plus. 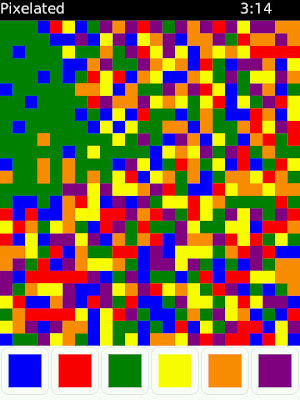 The object of the game is to change the colour of the squares until the entire screen is a single solid colour. This is done by using the coloured buttons on the bottom of the screen to change the colour of the square in the upper left hand corner and those surrounding it. Changing this square to the colour of those around it, allows it to slowly grow until it fills the entire screen. The ultimate goal is to do so in as few moves as possible. The game has two grid sizes for varying the strategy of play. Win/loss percentages are calculated for all difficulty types and grid sizes, as well as for the all time best scores. Pixelated Plus, one of the top rated puzzle games for the BlackBerry Storm, is now available for the BlackBerry Tour as well. Pixelated Plus is a game of Colour and Strategy. The newly released version 1.1 adds support for the 9630 and also addresses an issue with large font sizes. Pixelated, a simplified but free version of Pixelated Plus, is now available through BlackBerry’s App World. Pixelated Plus is a game of Colour. The object of the game is to change the colour of the squares until the entire screen is a single solid colour. This is done by using the coloured buttons on the bottom of the screen to change the colour of the square in the upper left hand corner and those surrounding it. Changing this square to the colour of those around it, allows it to slowly grow until it fills the entire screen. The ultimate goal is to do so in as few moves as possible.